The fallout from the Islamic State group's terror attacks in Paris has put the future of Europe’s passport-free travel area, known as the "Schengen Zone," in doubt. Several of the perpetrators were known to intelligence agencies, but were not intercepted. European ministers are due to hold an emergency meeting in Brussels Friday to look at ways of improving security. The Paris attackers were seemingly free to roam across Europe, coordinating the assault in France and Belgium. The continent's Schengen Zone allows people to travel without passport checks across 26 countries. It is a cornerstone of the European Union, but its problems have been exposed, says border security specialist Calum Jeffray of Britain’s Royal United Services Institute. 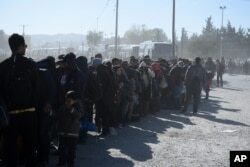 FILE - Migrants and refugees wait in a queue to be allowed to pass from the northern Greek village of Idomeni to southern Macedonia, Nov. 9, 2015. The Netherlands has proposed creating a so-called ‘mini-Schengen’ zone - excluding countries like Greece and Italy, where large numbers of undocumented migrants are arriving; but, German Interior Minister Thomas de Maizière dismissed the plan Thursday. Maizière said Europe’s political aim must be to make the total Schengen area as functional as possible - saying it is about the better control of entry and exit of so-called Syrian fighters and Islamic State group supporters. One of the Paris suicide bombers, Ahmad Al-Mohammad, appears to have posed as a refugee to travel from Syria to Greece, via Turkey. The chief planner of the attacks, Abdelhamid Abaaoud – killed in a police raid in the Paris suburbs Wednesday - boasted on social media of his ability to slip in and out of Europe to the Islamic State group’s heartland in Syria. France’s interior minister, Bernard Cazeneuve, Thursday said Abaaoud’s movements had not been tracked. Cazeneuve said Abaaoud must have gotten into Europe and then continued to France. It was only on November 16 he said, after the Paris attacks, that an intelligence service from a non-European country signaled it had been aware of his presence in Greece. France has called on its European partners to urgently improve security and intelligence – warning the fate of the EU itself is at stake.